There’s nothing that brings more joy to the world than a baby laughing. Whatever a baby’s personality – from the easily amused to the more stoic – parents will attempt almost anything to make their baby laugh. Some babies are easily pleased and love to laugh a lot. Other babies have bottom lips that drag so far down you never think they’re going to crack. When they do, it’s solid gold. To capture all this joy on camera takes special skill. When it comes to photographing happy babies, hobby and professional photographers alike have their work cut out for them. There are a few key things to remember about photographing babies. You’re not in it alone. Use the parents. You are not in control. The baby is. Hunger and sleep time rule. Pick the right time of day. If it’s your baby you’re taking a photo of, you have free reign to be as silly as possible and try all sorts of strange shenanigans. We’ve all seen Three Men And A Baby so we know this happens. However, if you’re taking a photo of someone else’s baby, some of these ideas are deal breakers. The perfect combo for the perfect laughing baby photo is to have a photographer and a parent doing their thing together. This might be a third party photographer, a friend or a parent. Ultimately, the photographer may assist in getting a laugh, but is certainly not wholly responsible for it. Finally, while it’s vital your baby doesn’t feel like he or she is being forced to laugh under duress (not that I personally understand the notion! ), remember laughter is, ultimately, a good thing. Just don’t start getting snarky if they don’t cooperate. Babies are people too. With feelings. This one’s usually discovered by accident due to someone nearby suffering an allergy, but it’s a winner! As long as your sneeze is fake, all is good. There doesn’t have to be any germs involved. You can hide your face or hide the baby. The options are endless. Then you remove yourself from your secret hiding place (namely your hands or a blanket or a wall) and reappear while saying ‘peekaboo’. I am not sure why I’m explaining this in so much detail. We all know this game, don’t we? This one does provide a bit of detail. That what you say. What you do is explained better by watching the beginning of this very cute video. You don’t have to go round and round the garden on the baby’s belly. Most people do it on the baby’s hand. Older kids love this as well. And it turns out adults also respond well to this (I know this from personal experience). Changing the tone of your voice works wonders. 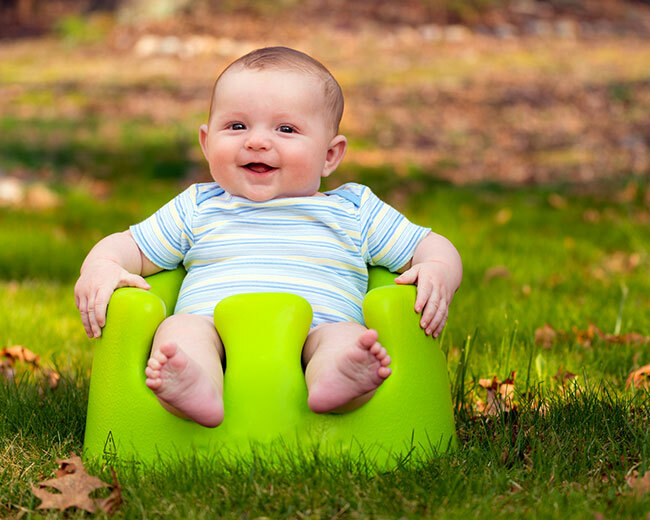 Babies love sounds you both laugh at, so if you’re laughing as well, they’ll see the joke. Have fun with it. This ones for photographers, aunts, uncles and best friends everywhere. If you’re a visitor, become the most entertaining visitor a baby has ever had in their home and jiggle your keys. Comedy gold. Some parents aren’t fans of tickling babies (who knew? ), but young children – once they learn to talk – often ask to be tickled so it can’t be that bad right? Babies often laugh at the anticipation of a tickle, so have a go at turning their frown upside down. Slap stick – pulling funny faces and faking stupid accidents – is a welcome relief from a genuinely stressed parent. That’s why it’s so funny. This one’s hard to do in front of strangers, so getting this on camera works better if you have a close relationship with your photographer! Basically, be silly. Like the Swedish chef on the Muppets. Been living under a rock or simply feel like watching the Swedish chef because he’s awesome? Here’s a video. Speaking of puppets, little people love hand puppets. Siblings are the best, most trusted in their delivery, but it’s OK for parents to have a go too. Just keep in mind that pupaphobia (fear of puppets) is actually a thing. Automatonophobia (fear of anything that falsely represents a sentient being) is also thing. Don’t make it a thing with your child. If your baby looks scared, don’t give up. Become friends with the puppet and show your baby that the puppet is friendly and nice. Go softly softly and, if tears result, try again later. After laughing so hard watching how much this baby loves paper being ripped, I too am a fan of the ripping paper. If all else fails, worth a try right? Once you’ve captured these joyous moments on camera, create a photo collage or wall display of your baby’s laugh – something that will cheer up you any time of the day and bring a laugh to all who visit your happy home. Order online now.